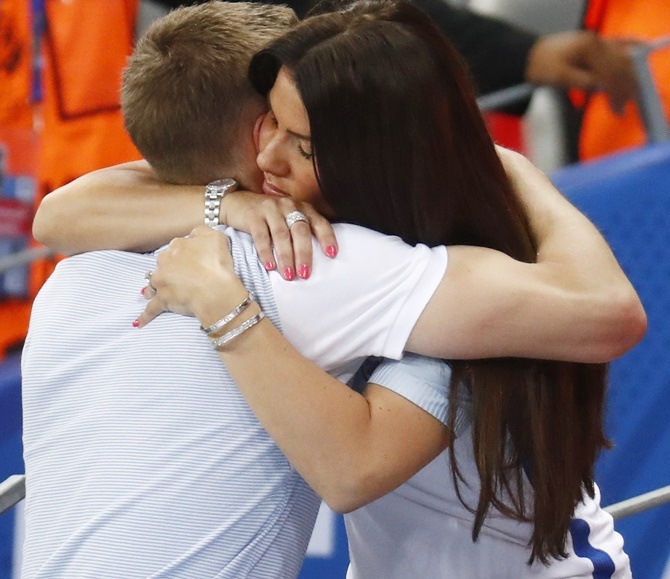 IMAGE: England's Jamie Vardy with wife Rebekah Vardy at the end of the match. Photograph: Kai Pfaffenbach/Reuters. The Wives and girlfriends of the England stars, playing in cash-rich Premier League, have rocked England shirts with their other-half's name on during the Euro 2016 in France. During the match against Iceland they were seen watching intensely from the stands at the stadium in Nice on Monday night. Rebekah Vardy, wife of Jamie Vardy and Coleen Rooney, wife of Wayne, were spotted at the stadium cheering their men. But after the loss they were also on hand to cheer their men up after the disappointing performance. Did England think it would be a walk in the park?